randy savage | This is KMI TV! MetLife Stadium may be getting the Super Bowl in 2014, but they’ll be getting the biggest event in wrestling first. Several sources are reporting what has been rumored for a while now, that MetLife Stadium in East Rutherford, New Jersey will host WrestleMania XXIX in 2013. This year WrestleMania, the signature event for the WWE, will be on April 1st at Sun Life Stadium in Miami, Florida. The main event was booked at last year’s WrestleMania, and will put current poster boy John Cena against Hall of Famer, The Rock. WWE is likely hoping this match draws as much hype as when The Rock went against Hulk Hogan 11 years ago. Also rumored to be on the card is Chris Jericho vs CM Punk (likely to be a much better match), Triple H trying to end the Undertaker’s WrestleMania undefeated streak (for the 3rd time), and Big Show vs Shaquille O’neal (ugh). With the main facts for this year’s event out there it leaves plenty to speculate on for next year in New Jersey. First off, WWE has had no problem scheduling big events outdoors, Safeco Field in Seattle, Caesars Palace in Las Vegas and so on. However WrestleMania has always been an early April/late March event and anyone that’s been to a Yankees or Mets opening day game can tell you it can get pretty cold outside. Throw in the fact that this 3 hour event will be starting at 8:00pm and you can bet WWE blankets will be a big seller (forget about the oiled up dudes wrestling in their underwear). March 31st is the most likely date for WrestleMania, but I’m curious if they push it up to April 7th, or even the 14th to at least take snow out of the question. As someone who got married outside in late March, I can’t bring up the weather factor enough. Next is the card itself. It’s possible that we get some news on a main event as early as this April, but that doesn’t mean we can’t make some guesses now. Coincidence or not, recently some of the booking in WrestleMania seems to relate to the venue. Shawn Michaels first took on the Undertaker in his home state of Texas, CM Punk got his biggest push at Money in the Bank in his native Chicago, and this year the Rock, a former Miami Hurricane, will headline against John Cena in his home town. No, I don’t think that Long Island’s Zach Ryder will headline. However Mick Foley could play a big part in it. Maybe a guest referee as he isn’t exactly in ring shape. You can bet that the usual suspects will all have roles. 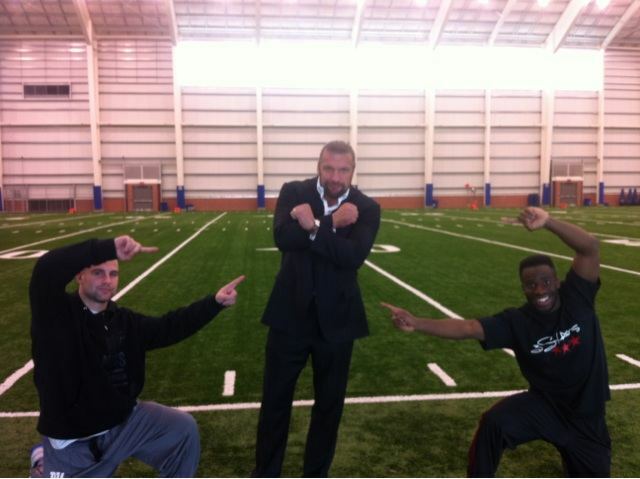 Triple H is the closest thing to a local superstar. Cena and Punk both get huge reactions (although for different reasons). More than any other event, WrestleMania feeds off of nostalgia. If the Undertaker’s streak is still alive (which would be smart, but something tells me it’s not going happen), Chris Jericho stands out as a name that could draw headlines, since no young lion is ready right now. The other question is celebrity appearances. WrestleMania has always been full of those, and often they are in the ring. Snookie, Floyd Mayweather, and Lawrence Taylor have already had matches, with Shaq likely next on the list. Could Mike Tyson, who’s being put into the celebrity wing of the WWE Hall of Fame make an appearance? Jay-Z will pretty much do anything for a check. I think the most likely celebrity to actually be in a match however is former Giant Michael Strahan. He is not that far past his retirement, he’s in great shape, and he would get a huge push from fans in his team’s stadium. All he needs is someone to make him look good (hello Jack Swagger!) and we’re set. Have any predictions of your own? Think I’m out of my mind? Leave a comment and be heard! With Valentine’s Day tomorrow what better way to celebrate then to go through some of the most famous weddings in WWE/WWF history. Weddings have always been a good way to kill 10-20 minutes on TV with little to no writing necessary, and while it’s not uncommon for a regular TV wedding to fall apart, wrestling weddings rarely get the chance to even get through the vows. Now if anyone has an objection to the following post, please stand up. If not, then I proudly bring you some of the best weddings wrestling has to offer. Let’s start with what’s rumored to be the only real wedding in WWE history. This “Saturday Night’s Main Event” hillbilly ceremony had it all. Mean Gene on the organ, Andre the Giant and Hulk Hogan as ushers, an interruption from Roddy Piper, brilliant commentary from Jesse Ventura, and even a foreign object falling on Joyce’s head in the middle of the ceremony (unscripted). The reception, at a barn of course, even had a guest appearance from Tiny Tim. This all gets even better with the rumor that according to Hillbilly Jim, the wedding was real. Not the most romantic ceremony in WWE history but a wedding is a wedding. This was the highpoint of the Undertaker’s “Ministry of Darkness” storyline. Undertaker had kidnapped Stephanie with the intent of forcing her into a dark marriage to please the higher power. This had all types of drama leading up to and during the ceremony, with different wrestlers (individually for some reason) running in to break it up only to be taken out by the Ministry until Steve Austin, in the middle of his Vince McMahon feud, came in to save the day. This of course led to a whole other series of events that I won’t go into here, but damn was it exciting television! Stephanie and Test’s wedding may have been the closest to actually resembling a real wedding. Tuxedoes with sleeves, actual wedding music instead of wrestling music. Even the camera angles made it seem like it could be for real. As a wrestling fan the thing was just awful to watch. Way too long (specifically the duet in the middle of it). The highlight for me is D’Lo Brown walking down the isle as a groomsman, and needing all the will power he had to not strut down the ramp. Triple H however was quick to being us back to reality, as after drugging Stephanie in Vegas he took her to a drive-through chapel where he married her first, ultimately leading to Stephanie turning heel, and more importantly, Stephanie and Triple H starting a real life relationship (actually getting married 3 years later) that resulted in Chyna (Triple H’s then boyfiend) getting fired and McMahon and Helmsley positioning themselves as the real power couple of wrestling. We can throw realism right out the window on this one. This wedding got a lot of attention since it involved 2 men. This whole sequence is just ridiculous, specifically the duo backing out at the last minute claiming it was all a publicity stunt planned by their manager Rico. Needless to say, the crowd was not pleased. Bonus points however for a fantastic mask applied to Eric Bischoff. The wedding itself was a hot mess, but the ending shows how good a Smackdown vs Raw rivalry can be. If they are going to continue having these inflated rosters, it wouldn’t be a bad idea to revisit the concept. The grandaddy of all wrestling weddings! 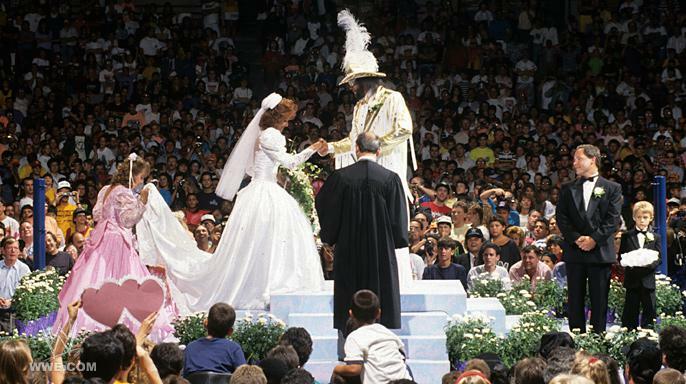 Although the Macho Man and and Miss Elizabeth were legally married in 1984, their 1991 ceremony set the standard for any wedding storyline that would come after it. I remember as a kid legitimately being happy for them. As far as TV weddings go, the only other one I can remember being this big of a deal was Luke and Laura on General Hospital. It was even the headliner of Summerslam at Madison Square Garden! “Sorry Hogan and Warrior versus Sgt. Slaughter, Colonel Mustafa, and General Adnan. You can’t be the main event. Randy and Elizabeth are getting married!” The odd thing about it is that after 7 years of marriage before this ceremony, Randy and Elizabeth got divorced a year later. Either way this wedding is easily the most memorable in wrestling history, and can also be credited with sparking Savage’s feud with Jake the Snake Roberts, who was mad at Randy for not being invited to his bachelor party. I wish I was making that up but I’m not that clever. Coming off the NFL Conference title games and with the Royal Rumble less than a week away, what better time than now to go through some of the biggest moments NFL players have had in wrestling. Both the WWE and WCW have tried to incorporate athletes from other sports with varied degrees of success. Here are some of the highlights. Coming fresh off of the Packers Super Bowl Win last year, Clay Mathews stepped in for an injured Vickie Guerrero to secure a victory for Edge on Smackdown. The Packers left no doubt of being wrestling fans all year, and this certainly capped off a hell of a run. WCW already put former Bear Steve “Mongo” McMichael on their roster, and since he was a train wreck in the ring, what better way to make him look good and give him a decent angle by putting him in a match with Packer great Reggie White. Gilbert Brown was in White’s corner to make sure the two competitors weren’t the fattest people in the arena that night, and unintentionally distracted the ref long enough for Mongo to lay White down with a steel briefcase (because people always carry documents in those). White retired a year later. Coincidence? Linebacker Kevin Greene came out on the side of Hulk Hogan and Randy Savage to act as enforcer against Ric Flair and The Giant. That didn’t work too well as Flair beat Savage with the help of some brass knux, but what really made this interesting was the timing. Greene was with the Steelers in 1996, and was set to play the Cowboys in the Superbowl just 5 days later. His team didn’t know he was going to appear in the show until they were watching it on TV. Whether that helped Dallas win 27-17 is anyone’s guess, but I still don’t thing Pittsburgh was too happy with their Hulk Hogan look alike. WCW just loves putting football players in the ring. Kevin Greene made his ring debut in a tag team match with McMichael (who turned on him for the Four Horsemen), but this match led to Greene facing The Giant (Big Show of course) at 1998’s Bash at the Beach (the proposed tag match never happened). Greene lost but the match has some meaning as it was among the last times a football player would be allowed to compete in professional wrestling. The NFL teams started requiring “no wrestling” clauses in Greene’s contracts, and by the looks of things that became the norm. When you think about football players wrestling (and I know you all do) this is the match that people usually think about. 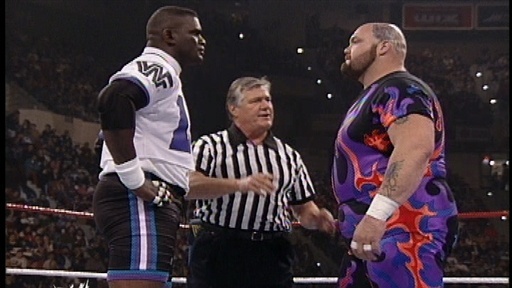 Taylor heckled Bigelow during the 1995 Royal Rumble, and Bam Bam got into a shoving match with LT ringside, igniting a feud that would culminate in the co-headline match at Wrestlemania VI. As a kid this blew me away as it was the first time I had ever seen an athlete from any other sport actually complete in a match. Not only that, but it turned lumberjack style with Taylor brining in a bunch of his NFL buddies (including White and McMichael). LT had a decent forearm too. This may be the greatest piece of wrestling history ever. The 1994 King of the Ring took place in Baltimore, Maryland. To gain more local interest, the WWF brought in Baltimore Colts legend Art Donovan to be a guest commentator for the entire show. Unfortunately for his broadcast partners Gorilla Monsoon and Randy Savage, Art likely just heard what wrestling was an hour before the show. The result is just magic. Imagine watching wrestling with your grandpa. Now imagine putting that on pay per view and charging 40 bucks for it. That is the 1994 King of the Ring in a nutshell. Note the number of times Art asks for the weight of the wrestlers, and how Monsoon and Savage gradually just ignore him. Enjoy.